How you can make your 4.0 breathe in more easily. The stock airbox and air filter (flows 374cfm @ 1.5inHg) are very restrictive. Replacing the stock air filter element alone with a K&N 33-2018 replacement (flows 455cfm @ 1.5inHg) will produce a gain of 3hp. Enlarging the front airbox opening and removing the trumpet-shaped restrictor from the airbox lid improves throttle response and adds a further 2hp. Insulating the airbox and tubing significantly lowers air intake temperatures compared with the stock set-up for further horsepower/torque increases. The next page shows how I modified my air intake in this fashion. Alternatively, there are aftermarket airtubes with open element K&N air filters available for the XJ 4.0 engine. Gains range from 5-8hp on a stock engine. 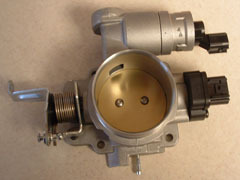 The stock 4.0 HO throttle body has a bore of 60mm that tapers down to 56mm below the throttle butterfly. Removing this taper to make the whole TB 60mm increases flow to ~515cfm @ 1.5inHg. A TB that's bored out to 62mm flows ~550cfm @ 1.5inHg for a 3hp increase on a stock 4.0 engine. '87-'90 Renix 4.0 owners need not feel left out. The stock Renix throttle body has a bore of 51mm (2.0") and flows a pitiful ~370cfm @ 1.5inHg. When bored out to 58mm, flow increases by 30% to ~480cfm @ 1.5inHg resulting in an 8hp gain. Alternatively, you can remove the Renix TB and replace it with a TB (with taper removed) from the HO engine. Joe Attardo's HO TB to Renix intake manifold conversion article explains how it can be done. The newer '99+ intake manifold is a superior design to the existing log-type manifold. The runners curve into a common plenum and the total manifold volume is much greater (4300ml vs 2600ml). Ram charge wave tuning is stronger resulting in more mid-range torque (6lbft) and top-end power (3hp). Gojeep wrote an excellent article about converting from a '91-'98 style manifold to a '99+ version. Rusty's Air Tube is one of the best things you can add to your vehicle. The air tube can be installed in about 10 minutes and will deliver 5 to 10 horsepower and will greatly improve fuel economy. Rusty's Air Tube is as simple as it gets but does the same job as the other guys that are priced 5 times as much. Rusty's offers two K&N filters to fit the Rusty's Air Tube which must be ordered separately. The 4.5" x 5" standard filters are plenty of filter for the 2.5 and the 4.0 liter engine. The 6" x 9" is recommended for the V8 engines and can be used on the 2.5 and 4.0 engines for a mean and muscle car look. This Generation II Fuel Injection Performance Kit (FIPK) is now available for Jeep Cherokee 4.0 XJ's. Part # is 57-1519 for '91-'95 models, and 57-1518 for '96-'01 models. The filter flows 607cfm @ 1.5inHg and the FIPK produces a claimed 8hp gain. A kit is also available for 1997-2001 Jeep Wrangler 4.0 TJ's. The part # is 57-1514-1. All BBK 1991-2003 Jeep 4.0L throttle bodies are designed to increase airflow and improve horsepower from between 7-12 HP depending on vehicle and application. F&B Jeep throttle bodies are available in 66mm and 68mm bore diameters (stock is 60mm necked to 56mm). Some intake manifold porting should be done to enlarge the manifold opening. These throttle bodies have a 3" inlet and are compatible with stock air intake systems (not recommended because of flow restriction) and most aftermarket air intake systems. This kit is designed to up-grade the early three bolt throttle body to the 1991-up four hole, larger bore High Output (HO) unit. Kit consist of all brackets, bolts, adapter plate and standard HO throttle body. 62MM Hi-Flow throttle body for 2005-2006 4.0L Jeep engines. 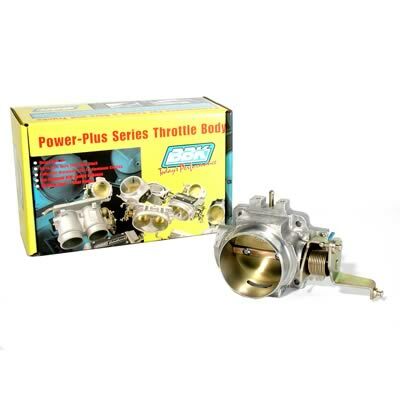 Ideal for stroked and modified engines for maximum power gains. A 62mm Throttle Body Spacer # HES62TBS can be added for addition power gains and a high flow air filter or filter kit can also be purchased for maximum performance. All 1991-95 4.0L applications should purchase our Adjustable Fuel Pressure Regulator # HES9195FR for optimum results as the factory PCM programming is lean. Note: 1997-2004 will need to install your factory sensors on the new unit.